SEVILLE, Ohio – July 24, 2017 – V3 Transportation, an innovator in expedited transportation solutions, is proud to announce the company will be making a donation to the St. Christopher Truckers Relief Fund in honor of Robert Burton, an owner-operator in the V3 fleet. Burton was recently named the Expediter of the Year during the Expedite Expo. Burton donated the $500 that accompanied the inaugural award to the St. Christopher Truckers Relief Fund, which is a charity dedicated to helping truck drivers whose medical problems have led to financial hardship. The nomination for the Expediter of the Year was submitted by Christy Burton, Robert’s wife and co-driver. In her submission to the committee, Christy cited the numerous instances since they have been driving together when Robert provided assistance to motorists and truck drivers during their travels. In one situation when the Burtons encountered a burning car filled with oxygen tanks along I-35 in Texas, Robert was able to coordinate a blockade of traffic on both sides of the highway before authorities arrived on scene, keeping people safe from the ensuing explosion of the burning car. Christy Burton did not tell her husband about nominating him for the award until he was named as one of the finalists. The nomination and the subsequent award took Robert by surprise. To read the feature from The Trucker, please click here. To read the feature coverage from ExpeditersOnline.com, please click here. To read the story from Heavy Duty Trucking Magazine and TruckingInfo.com, please click here. To read the story from the Commercial Carrier Journal, please click here. To read the story from FleetOwner Magazine, please click here. To read the story from TruckingIndustry.News, please click here. Sponsored by On Time Media and the Expedite Expo, the Expediter of the Year was chosen by an independent, three-judge panel, which consisted of representatives from CIS Insurance, National Truckin’ Magazine and the Women In Trucking Association. The judges narrowed down the field to three finalists before ultimately choosing Robert Burton as the Expediter of the Year. 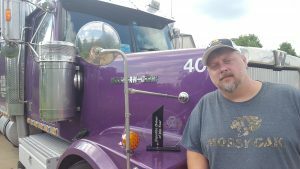 Prior to making the trip to the Expedite Expo, Robert and Christy made the decision to donate the $500 cash to the St. Christopher Truckers Relief Fund – if Robert was selected as the winner. The Burtons had been inspired by the mission of the fund, having been out of work following an accident in which their personal vehicle had been struck at a high speed by a motorist. Robert and Christy Burton shared their story of the nomination, the award and the donation with the Next Mile Podcast from Missing Word Solutions. Through the SoundCloud post below, you can hear the interview with the Burtons as well as interviews with V3 Transportation Chief Operating Officer Paul Ratcliff and Shannon Currier of the St. Christopher Truckers Relief Fund. Established in 2013, V3 Transportation has rapidly established a reputation for quality and reliability as an expedited transportation service provider for automotive, high-tech and numerous other industries. V3 has been recognized for excellence by national transportation publications in the areas of customer service and fleet operations. Website: v3transportation.com.